These Cordless Hydraulic Bolt Cutter units are portable battery powered hand held products ideal for gaining quick access to properties that are chained, barred or padlocked.The TCC16 is also capable of releasing chained / D clamped protestors without risk of injury. 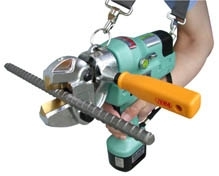 The Bolt Cutter Units can cut up to 16mm steel, quickly and safely with no heat generation, sparks or risk to the operator. These Bolt Cutters are some of the best on the Cutting Tool Market.